I’ll start by saying I’m a bipolar sociopath when it comes to romance. I’m currently listening to “What Kind of Love” by Childish Gambino. I long for human contact of some sort. A swirl of emotions are currently swelling within me: regret, loneliness, fear, self-loathing. However, I know that in an instant I’ll revert to this jaded version of myself that abhors contact of any sort and relish in my current single status. It’s a curse being so consistently inconsistent, I tell you. Recently I went on a late night Netflix binge and ended up watching the entire first season of Aziz Ansari’s “Master of None” in one sitting. For the uninitiated, it’s an episodic romp about a young New York actor, Dev (played by Ansari), trying to wade his way through life in the big city. We follow Dev as he tackles issues that all emerging adults face; he loses relationships with close friends as they marry off and have children, his relationship with his parents suffers as he struggles to find his own identity and reconcile that with his culture, he spends hours searching Yelp reviews for the best restaurants, and perhaps the most relatable of them all: we follow Dev on a few of his romantic outings and watch his relationships wither and grow. It was here that the show really shone through to me. Seeing my fellow man struggle to find love in this digital world was surprisingly refreshing. Why go to the bar when we have Tinder? How long do I wait to text this person back, or do I wait at all? The semantics of modern dating is something that I had never really taken a step back to consider in its absurdity. Thanks to the internet, there is a sea of a literal million faces at the tap of a finger. For better or worse, we have more romantic options available to us than at any other point in history. Yet, there is still a struggle to find the “right” person. Not only that, there are so many rules for meeting people and getting to know them online. It’s infuriating! If I text someone back too soon I come off as overly eager, but if I wait too long then I seem cold and uninterested (and the proper window to message someone back is different for everyone!). I was determined to do some research on the wild west that is Modern Romance, so I turned back to Mr. Ansari. Modern Romance is a collaborative effort between comedian/actor Aziz Ansari and New York University sociology professor Eric Klinenberg that sets out to make some sense of the current dating landscape in the age of cell phones, internet, and emerging sexuality. I honestly expected more of a humorous approach given Ansari’s background but the entire book was incredibly well researched and presented. It is filled with statistics and graphs that are pulled from several different study groups spanning the globe, as well as input from some of the premier dating websites. A few major points it tackles are deconstructing the idea of a “soul mate”, looking into what people expect and are expected of when making first contact, confronting all of the choices available to us, and “settling down” in an era when infidelity is only a click or text away. And then… that’s it. I never responded. I didn’t like her response, so I just went about my life and forgot all about it. I’m trying to imagine this same exchange happening in a face-to-face encounter. I’m at a coffee shop. I see an attractive lady sitting at a table alone, and she’s reading one of my favorite books. That young woman could be absolutely amazing, perhaps even my soul mate, but I’ll never know because I completely brushed her off after the first sentence she said to me, EVER. Wow… low blow, Joe. This leads me to another pitfall of modern dating. With the advent of social media, we’re all more connected to our fellow man than we’ve ever had the ability to. The advantages are unmeasurable. The ability to meet people we never would have otherwise, being able to stay in contact with loved ones who are away, etc. However, when it comes to social media we only see the best of what people have to offer. We wouldn’t post any old picture of ourselves, only the best pictures of ourselves. The way we talk online has likely been curated and processed into the best string of thoughts we could create. It’s important to remember that the way people are on the internet is not who they are in reality. It’s quite easy to misconstrue the two. The temptation to idealize people and put them on some sort of pedestal is overwhelming, if not downright unavoidable. How well can you know a person based on a couple of pictures and a few sentences? For instance: I was talking to a girl recently who I had met through happenstance on Tinder. The moment I saw her profile come up on my phone, my heart sank into my stomach. I knew who she was. I had seen her almost a year prior on Instagram and had been absolutely smitten with her. She was dating someone at the time, and I’m incredibly shy and would almost never approach a woman without some sort of prior contact, so I just cut my losses and decided it wasn’t meant to be. However, seeing her now on Tinder, a year later, I was gripped with anxiety. This was it. Either we match, or we don’t. It’s all out of my hands once I make my decision. I talked myself down before I decided to swipe right (meaning that I “liked” her profile, for those who are unaware). I told myself that there’s no way that she would like me, she’s way out of my league, etc. My heart proceeded to melt into my shoes. The wonders of the internet had managed to give me the perfect introduction to this woman whom I was interested in, so in this way the digital age had done my dating life a favor. On the other hand, I had to learn the lesson that I alluded to earlier: People are not their online persona. They are not the person that you create them to be in your head. These are dangerous waters, and can doom a potential romantic encounter before it ever begins. So, we message back and forth for a few days before I gather the nerve to ask her out on a date. The day of our date, I go and get a fresh haircut, consult a friend about my outfit choice (our very own Tome Raider, Chelsea. Hi, Chelsea! I looked fly), and as anxiously and nervously as possible, I drive to her apartment to pick her up. My heart is racing, my palms are sweaty. This is the woman I’ve been swooning over for a year, the woman who I thought was completely out of my league. I almost can’t even handle the pressure. Then, I see her for the first time. She says her first words to me. We hug. We get in the car and head to our destination. She’s not the person I thought she’d be. She’s not the goddess I had unfairly created in my head. How could she be? I’d made her into some unattainable symbol of perfection, no one would ever have measured up. Don’t get me wrong, we had great conversation and she looked absolutely gorgeous. We stayed at the coffee shop until they kicked us out, but there had been a damper on the evening. I tried not to let it show. I had absolutely no reason to be disappointed, she was a wonderful date, it was my own fallacy that had brought the date down. As the night winded down we listened to music in my car and it came to the point to part ways. I remember stupidly contemplating whether or not I even wanted to ask for a second date. Then, she did something I didn’t expect. She told me she had a key to the roof of her apartment and asked if I’d like to go up and see the view. Of course I did it, IT SOUNDS AMAZING. And guess what? IT WAS AMAZING. We sat in the chilly night alone and looked out at this astounding view of the city skyline, sparkling against the darkness. It was there on that roof that she opened up to me, if only a little bit. She told me bits of her life. She told me some of her fears. I did the same. An hour before this I was contemplating if I even wanted to go on a second date because I had put this woman on some ridiculous pedestal that she couldn’t aspire to, and now I was ready to spend all night talking to her. I took the chance to put my perceptions aside, and get to know the actual person that I had taken out on a date, not some imaginary person I had seen on Instagram. She was an actual person with aspirations, fears, ambitions. Underneath the ludicrous filter I had placed over her was a wonderful woman that I had almost completely dismissed because of the asinine assumptions I had made from the internet. I learned a valuable lesson on that rooftop that night. I’ll never again count someone out because of some preconceived notion of who I think they should be. Regardless of how a relationship may end up, the time you spend getting to know someone intimately is never wasted. So, I’ve gotten this far, and I haven’t really talked about the book much, I get that. It wasn’t really my goal from the beginning to review the book. I think most of you have a good idea of whether it’s something you’d be interested in or not. If anything I’ve written here was of any interest to you, then go out and buy Modern Romance, it’s a real treat. I really wanted the opportunity to use this book to speak a bit about my experience with dating in the digital world. It’s tough. We’re all searching for something, and there are a plethora of ways to find it. How do you choose? How do you know what’s right? What if you pick someone, and then the next best thing is one OkCupid match away? Your ex is only a Facebook message away. A Snapchat can lie between a happy marriage and a ruined one. The landscape of modern dating is tumultuous, but maybe we can all learn to look at the underlying purpose of it all: to meet people we care about, invest in them, and have them do the same. Modern Romance gets 4 out of 5 stars. The laws are the foundation of the story; they are simple, black and white. Between the black and white is a lot of gray. The gray is where Asimov’s brilliance lies. The laws appear as a hindrance at first, but they are an opportunity to be creative. The book begins in an interview with Dr. Susan Calvin, chief robopsychologist of U.S. Robots and Mechanical Men, Inc. (USRMM). The short stories that follow are her experiences and those of USRMM employees, notably Powell and Donovan. The first story, Robbie (a fitting name for a robot right! ), shows his friendship with a young girl, Gloria. Circumstances separate the two friends and Gloria is accompanied only by her sadness. Love and friendship, no matter how unconventional, is a creature desire, even for those made of metal. In Runaround, the second short story, we join Powell and Donovan, field-testers for USRMM prototypes. Powell and Donovan encounter a situation where Speedy (robot) is behaving oddly due to an internal conflict between the 2nd and 3rd laws. How will they fix Speedy? The resolution involves Asimov’s ability to use that gray area. The third story, and last I will cover, is titled Reason. Powell and Donovan are on a new assignment and joined by a new robot, QT1 or Cutie, as they call him. Cutie is a more advanced robot than previous models. He eventually becomes sentient stating, “I myself, exist, because I think.” Cutie cannot be reasoned with, a dangerous predicament for the protagonists. Seven stories follow the aforementioned, each with new ideas and questions. I, Robot explores love, religion, the metaphysical, deception, societal pressures, fear, and more. The reader views these as robot encounters but do humans not experience the same? The problems, thoughts, and feelings the robots face are also ours. 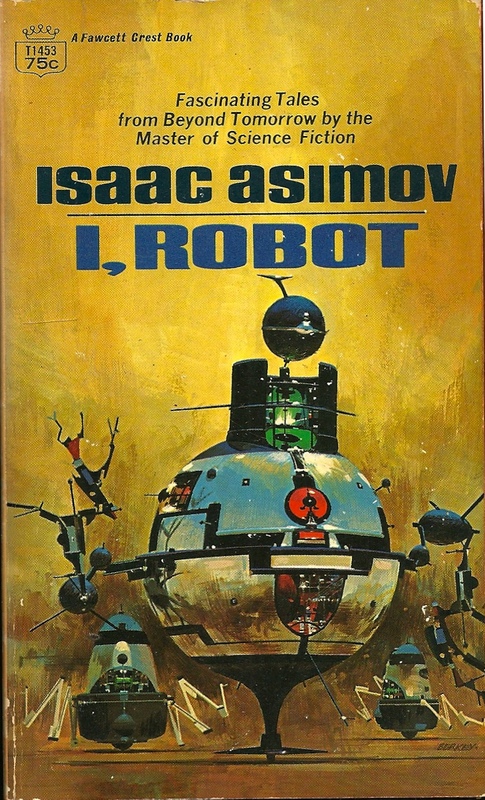 Asimov does as the good artist does, creating a work that is both immersive and reflective. He succeeds on all accounts; it is both thought-provoking and entertaining. It teaches with each turn of the page. 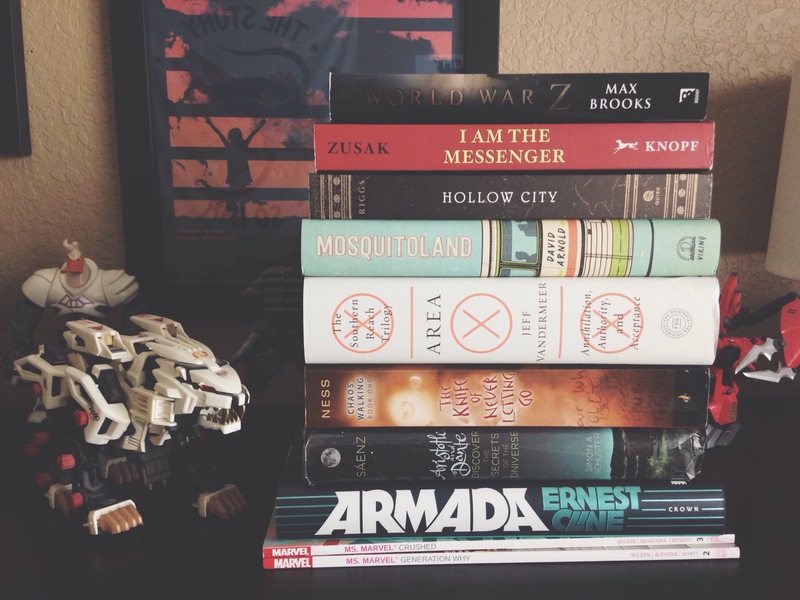 I hope that you will read, learn, and, most importantly, enjoy I, Robot. Landline was perfectly heartwarming, eye-opening, and tense, with just the right amount of fantasy involving a time-traveling phone. 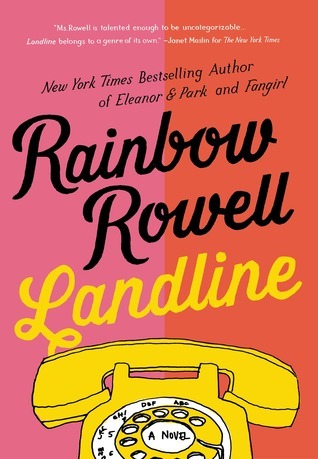 It was the perfect book for dragging me out of my book slump, and I found I enjoyed RR’s writing much more when I was reading something in which I was the target audience (see my review of Eleanor & Park). A few things RR nails every time: her characters, her dialogue, her love stories. She creates a love story you want to mimic and characters you want to be, fall in love with, or be friends with. Her dialogue is so on point I sometimes wonder if she just records her daily life and then inserts it into a book she’s working on at the end of each day. Her love stories have details that make me sure they are her details or someone she must know very well…minute things like Georgie and Neal’s first kiss. The moment was so personal and vivid, I assume it must have happened. Then there was the list she made when trying to cope with the reality/fantasy of possibly having a magic phone, and she referenced one of my favorite TV shows (Lost) and all-time favorite movies (It’s a Wonderful Life). Georgie’s train of thought followed what I’m sure I would have been thinking in her situation, which only tells me what I already knew: RR really gets her audience. The reason her books sell is because of their honesty to real life. Regardless of how or where she gets her inspiration, she works it. She molds it and makes a living, breathing story with it. Sometimes writers pour themselves out in a way that is exhausting for the reader, leaving them begging for the end of the chapter so they can rest. Rowell’s style is so captivating, I found myself doing just the opposite. I would think, “Okay, last chapter. You’ve got other things to do.” Then I would find myself immersed in another chapter far further in than I’d promised myself. Her writing style is captivating. Rather than leaving me tired, it woke me up and kept me guessing at the end of each chapter with just enough mystery to intrigue me. I love that Rowell can write to multiple audiences, both young adult and actual adult. She writes in a way that I perceive must be genuine. She has the ability to create relationships worth fighting for with characters who are relatable. I can’t wait to read more of her work, and I hope she continues to have success. I’ll be rooting for her. My only complaint with this book was it really made me long for Christmas break. As I’ve previously stated, I’m a sucker for an unreliable narrator. Annihilation is short, vague, and contradictory, yet captivating. With less than 200 pages, it feels more like a prologue than a prequel. Annihilation takes an intricate look into reality and our perceptions of the realities we choose to live in. Told from an unnamed female protagonist’s perspective who is a biologist on expedition, we are able to view a mind clouded in uncertainties. This limited range of view is vital to the telling of the story, and although I knew I couldn’t trust this woman entirely, I wanted to all the same. She gave a perfectly vague account of an unpopulated area shrouded in mystery, and I found myself wanting to travel there to witness it firsthand, even if I might not come back from it. Area X is beyond civilization’s border, and the only people allowed to cross the mysterious boundary into its wilderness have been specially chosen purely for research purposes. The people venturing into this unknown wasteland are well-trained in their skill sets and are used as variables to explore the constant that is the “uncharted” territory. Accompanying our biologist there is also a linguist, psychologist, surveyor, and an anthropologist. All women; all serving a distinct purpose on their mission. Each of these women have done away with their birth names before setting out, thus attempting to rid themselves of their identities before meeting their awaited fate in Area X. The biologist, as she had been trained to, observed her surroundings, looking for trends and trusting her senses to tell her the truth about this area that no one seems to ever really come back from. The biologist recently lost her husband to a previous expedition in Area X, lacks emotions. Even when talking about her lost husband, she doesn’t seem all that sad. This lack of character development is honestly my only issue with the first part of this trilogy. The main character was not relatable, and anytime this happens, it’s a problem. Despite that, I enjoyed reading Annihilation. I will definitely read the Southern Reach Trilogy, however, I am in no hurry. Because of the writing style, it was not a fast read or easy read. I think to enjoy this one you really have to be in the right mood, and it caught me at just the right time. It just keeps growing! I’ve been able to knock out so many titles this summer, but I add them more quickly than I can chip them away. For us teachers, school is only weeks away, and time is ticking. I always manage to read during the school year but never as much as I’d like to. 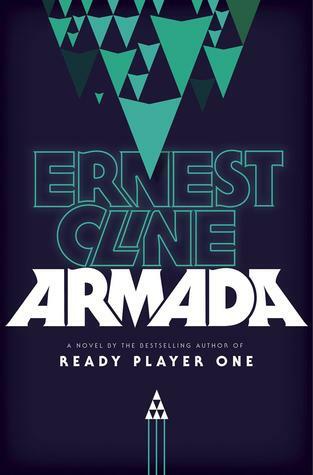 Currently I’m digging into Armada. 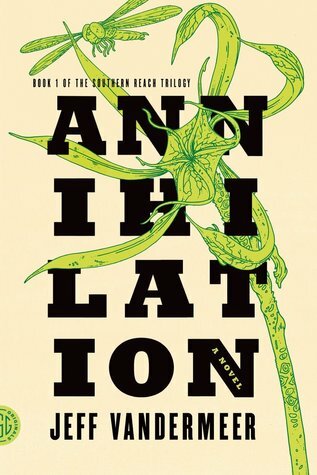 Next on my list is Mosquitoland followed by Annihilation, the first book in the Southern Reach Trilogy. I’ll probably throw those Ms. Marvel volumes in as well. The rest is to be determined at a later date. Any thoughts or recommendations on books to add to my list are greatly appreciated. Also, add me on Goodreads! I wanted to bury this book in a dune somewhere because it’s just not worth the coin. I thought I would enjoy this like I did Wool, but it was about as easy to read as it is to run a mile on the beach. It was slow going, and I felt little motivation to complete it. Sand is about family, justifying the things we do for our families to earn a living and also to keep ourselves afloat in the midst of all life blows our way. It’s about how we cope after an unexpected loss and always hoping there’s something better out there for us. Out of all the problematic worlds I’ve read about, Hugh Howey has managed to create the one I would most likely not be able to tolerate. I might survive the world of Sand, but my sanity would not. Sand isn’t horrible because of a ferocious government, corrupted societal laws, or a declining ecosystem, though. I could not live in this world because of all the freaking sand everywhere. Always in my mouth, in my shoes, in my house, and forever sweeping and shoveling just for the wind to inevitably bring it back to me. No thanks. Howey let loose in Sand with a mass of explicit vocabulary and not much, but just enough graphic imagery of bodies horrifically mangled, leaving plenty of unwanted images in my mind. I don’t mind a little language here and there or things of graphic nature when I’m anticipating it, but the way it leaped of the pages so unexpectedly left me in a state of shock. 1. It was not predictable. No shocking endings or anything crazy, but there was not much of a basis to predict anything from. This could have been from the lack of foundation we had, though. 2. I’ve never read anything like it. The first section of the omnibus seemed like it was going to be just like Wool, too, which would have upset me. His world was not based off of any dystopian formula I’ve seen before, so we can commend him for that. 3. His ideas were clever. And honestly, they weren’t poorly constructed. Scuba diving through sand as one would through water made sense. I thought having the characters scavenge beneath their town for buried cities was probably the coolest thing about this book. 4. There are nuggets of universal wisdom scattered everywhere. “Witnessing the aftermath of the destruction made the danger…real. Fear required precedents.” I love being able to dismantle a quote from the text and be able to apply it to life in general. I can’t say I haven’t learned anything from reading Sand, but my time spent reading it could have easily been better spent. I did not enjoy it, and for that I had to give it a 3/5. 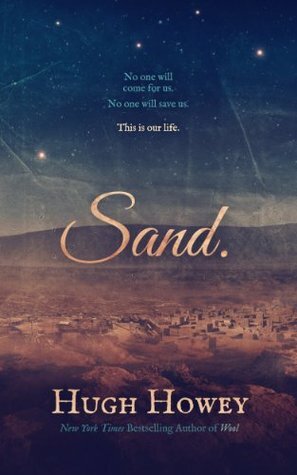 One thing I hope all who have read it or decide not to read it based on this review take away is we are all just grains of sand, helpless to where the wind takes us, drifting from one dune to the next. We are spit out, shaken from boots, and brushed off from shoulders, but we are the foundation of society.